Microsoft this week began to accept applications for pre-orders for its HoloLens augmented reality device. Right now, the company offers HoloLens only to software developers looking to build applications for this new environment.Interested developers will have to pay $3000 per unit for this development kit, which is a hefty sum. 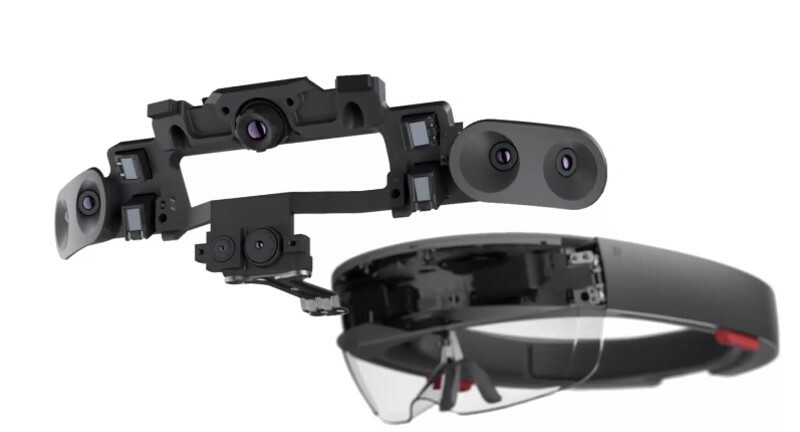 Moreover, additional technical specifications of HoloLens revealed by Microsoft give us a bit of insight into what is inside this augmented reality wearable. The Microsoft HoloLens is custom-built wearable personal computer running Windows 10 operating system. The HoloLens is based on an undisclosed 32-bit Intel processor and a custom-designed Microsoft holographic processing unit (HPU) that processes data from multiple sensors. In fact, the list of HoloLens’ sensors is very impressive: the device features one 2 MP video camera, an inertial measurement unit (which means, a set of accelerometers, gyroscopes and maybe even a magnetometer), one depth camera, four environment understanding cameras, four microphones, an ambient light sensor as well as mixed reality capture IC. Since the mixed-reality headset does not use any markers or extra cameras to track movement that are located outside of itself, a sophisticated set of sensors inside it is absolutely required.The HoloLens can track gaze, understand gestures and voice commands thanks to its sensors and underlying software. The device is equipped with 2 GB of RAM (1GB for the processor and 1GB for the HPU) as well as 64 GB of NAND flash storage. The HoloLens can connect to the Internet or other devices using Wi-Fi 802.11ac and Bluetooth 4.1 LE wireless technologies. In addition, the device is equipped with a Micro-USB 2.0 port, a 3.5 mm audio jack and a surround sound system. The HoloLens can operate for two or three hours on one charge, which is not a lot, but its unlikely you would be wearing this around for a work day. It can also charge while in use, tethering it somewhat but allowing developers to test applications on it as they work. The AR headset from Microsoft uses its advanced sensors to track the position and orientation of the user's head relative to their surroundings. The system attempts to predict position where the user's head will be in at the exact moment and applies holograms accordingly. Microsoft makes a number of recommendations to software makers how to ensure that the hologram is added to the right place at the right time, but the system constantly monitors not only data from sensors, but also adjusts the length of the rendering pipeline. The HoloLens uses two see-through holographic lenses (each of which consists of three layers — red, green and blue) with an optical projection system to generate multi-dimensional full-color holograms. Maximum resolution that the HoloLens can render is 1268x720 (per eye), which is why actual holograms have a limited field of view. The holographic content is put at two meters distance from the viewer because Microsoft believes that this is optimal for eyes and will not cause any strain. Since augmented reality is not about maximum resolution, Microsoft puts a lot of focus on quality of each hologram because it is crucial for its usability. According the company, the lenses support holographic density of up to 2.5K radiants (the more radiants and light points there are, the brighter and richer the hologram). But while the quality is very important for AR, to ensure smooth framerate (at least 60 fps) Microsoft suggests to lower resolution of images to 634x360 in certain cases. Because Microsoft’s HoloLens is a fully-fledged wearable PC, it has its own limitations. The CPU is certainly going to be low powered to allow it to be used mounted on a wearable, possibly Quark or Atom, but Microsoft is not disclosing this yet. Since storage of the wearable PC cannot be upgraded, Microsoft caps maximum allocated size for one application to 900 MB. Finally, the software giant warns that because certain applications may require too much processing power, the system-on-chip of the HoloLens can overheat. To prevent that, HoloLens will shut down the application if temperatures hit certain levels. Consequently, even if a developer managed to create something that uses all the resources of HoloLens, it is not guaranteed that their app will actually work in all circumstances, at least with this developer kit. So far, Microsoft has developed a limited list of applications for HoloLens to show off capabilities of the AR to developers. The list of productivity apps includes Skype, HoloStudio and Actiongram, whereas the list of entertainment programs includes HoloTour, RoboRaid, Young Conker and Fragments. With only a limited number of programs that support holographic experience, it makes sense that this is a developer kit and not a public release. Also, the original demos of Hololens used what Microsoft called an "Air Tap" to do selections. This was not that difficult to pick up on, but to make this easier they will be offering a Bluetooth connected hand held device to let you do the clicking with that, rather than having to do the gesture. Since the Hololens supports Windows 10 and Bluetooth, there is likely opportunity here for more peripherals to do other tasks as well. The Microsoft HoloLens Development Edition will only be available to software developers in the United States and Canada initially. The developers have to participate in the Windows Insider program. To buy the HoloLens, programmers will have to share their ideas regarding their applications with Microsoft. If the software giant likes the idea, its author will get a chance to buy the AR device. The software giant plans to ship the first batch of HoloLenses to chosen developers on March 30, 2016. When additional devices are manufactured, Microsoft will invite more applicants to purchase to the HoloLens. 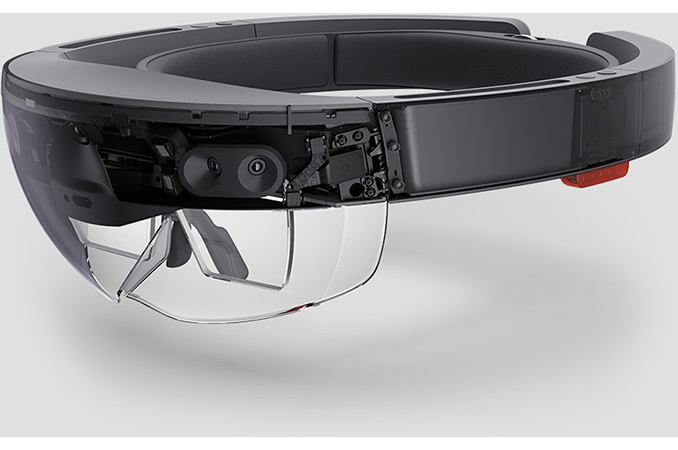 Interested developers may apply for a Microsoft HoloLens device here. "The Microsoft HoloLens is custom-built wearable personal computer running Windows 10 "